A relatively common summertime occurrence took place across coastal Illinois during the afternoon of June 24th. No, it was not a thunderstorm or any kind of severe weather; instead it was something much more subtle. 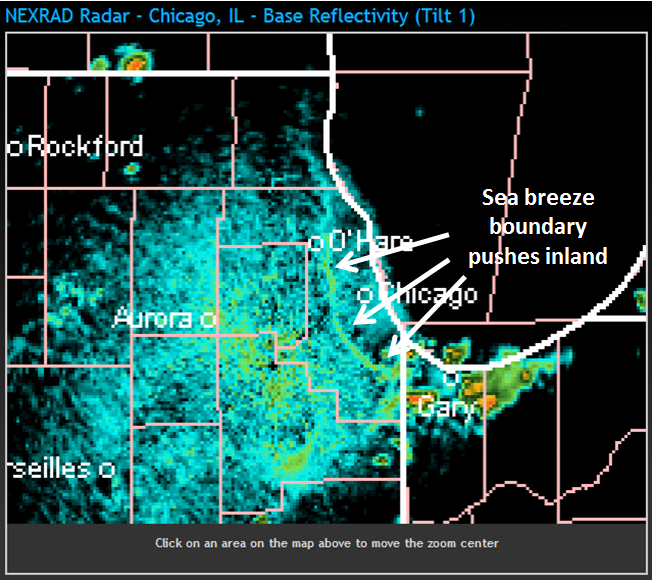 A lake breeze from Lake Michigan moved onshore and backed first through the coastal plain before eventually making it several miles inland through downtown Chicago. As a result, easterly winds from off the lake itself resulted in cooling temperatures during the hottest part of the day across these locations. Although this phenomenon is relatively common, especially during the spring and summer months, very few actually know the true cause of why this occurs. The phenomena deals with the temperature difference between the land and a nearby source of water. During the hottest months of the year, land typically warms much faster than water and can result in a temperature departure of at least 10 to 20 degrees. As this occurs, an area of relative high pressure (associated with cooler temperatures) forms over the water, while an area of lower pressure forms over the land. 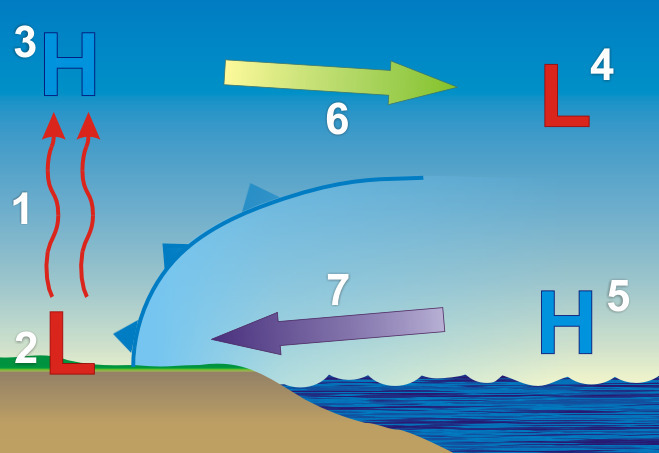 Because the wind blows from high to low pressure (see our blog here, which explains high versus low pressure), this temperature difference induces a wind from off the water, which gradually propagates inland across surrounding locations. Along with this, cooler air is also funneled inland and will continue to do so until the lake breeze (or more generally referred to as a sea breeze when induced by an ocean surface) weakens as it is further removed from the water source. A schematic of this is shown below. Scientifically speaking, a sea breeze is a weather front – similar to a warm or cold front, except on a smaller scale. It is sometimes also referred to as a convergence zone, as cooler air from the sea meets or “converges” with warmer air from the land. At the front, warm air flows upward and cold air continually moves in to replace it from below. This causes it to always move progressively inland, as it is guided by the cooler sea air. This boundary can even be seen on radar imagery (see below) in most instances. Interestingly enough, it is not precipitation that the radar is “seeing” but instead is actually insects! That’s right – these convergence zones tend to be associated with a higher concentration of insects as they are blown toward the boundary from either side. The different values of reflectivity from the radar beam allow the insects to be seen. Although precipitation is not typically associated with the sea breeze boundary, in a very unstable environment, they can provide just enough of a trigger for isolated shower and t-storm development (as seen over the south-side of Chicago below).